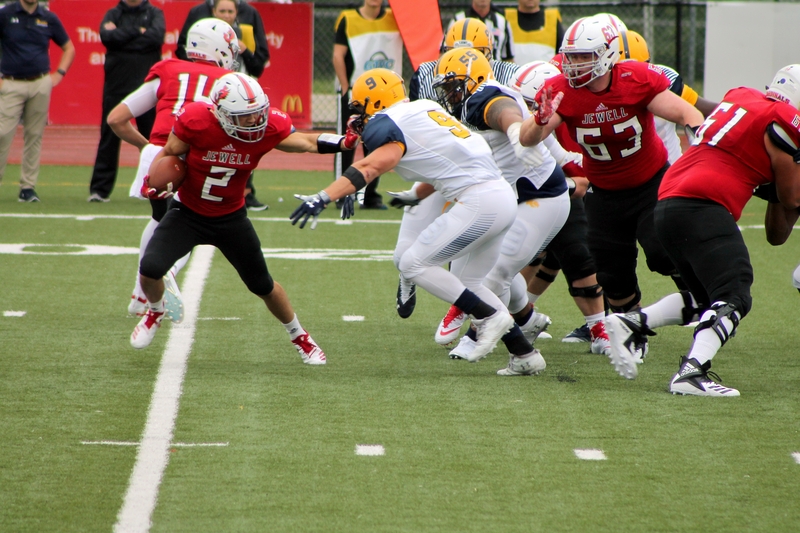 Jewell Cardinals play Texas A&M at William Jewell College, Sept. 2018. Football has become a key part of many Thanksgiving celebrations. At the professional level, there has been an annual game hosted by the Detroit Lions and another by the Dallas Cowboys since 1978 and in 2006 a third game was added to the Thanksgiving schedule. This may make football seem like a relatively recent Thanksgiving tradition. However, it is actually a much older tradition than most people realize – almost 150 years-old. The first football game played on Thanksgiving was a match between the Young America Cricket Club and the Germantown Cricket Club in Philadelphia in 1869. The first college Thanksgiving day game was between Princeton and Yale in 1876. These games were played when football was still evolving into the sport we know today, but they served as the stepping stones for what would become an annual tradition. Since then, football games have been played on Thanksgiving nearly every year on the high school, collegiate and professional levels. Football on Thanksgiving has become more popular over recent years. All three games this year drew over 20 million viewers and the late-afternoon game between the Dallas Cowboys and Washington Redskins had over 30 million viewers – a big increase in the number from last year. Some families do more than just watch football on Thanksgiving and choose to play as well. Most families play touch football, in which one tags the ball carrier with both hands as opposed to tackling them. Some families even play in several inches of snow and make custom jerseys. One Wall Street Journal writer even made a silly list of rules for Thanksgiving touch football. Playing football on Thanksgiving has become almost as big of a family tradition as watching the sport is. Every family celebrates Thanksgiving differently. There are countless different traditions among each and every family, but there are some – like turkey and the parade – that are a part of most family’s Thanksgiving celebrations. After almost a century-and-a-half, football has become one of those common traditions.